The long awaited PROSTAFF 5 Laser Rangefinder 6x21 is the next generation tool built for precision, speed, and consistency out to 600 yards. Incredible .1 yard display makes the PROSTAFF 5 stand out from the crowd--and its unique switchable display option allows you to select the display mode that contrasts best against your subject and background. Pick it up and the aggressive styling and palm-sized sensory ergonomics hint at the exceptional performance that lies within your hand. The 6x multicoated optical system boasts a huge ocular lens, long eye relief and optimized viewfinder display to provide the wide field of view needed for immediate subject acquisition and maximum ranging speed. 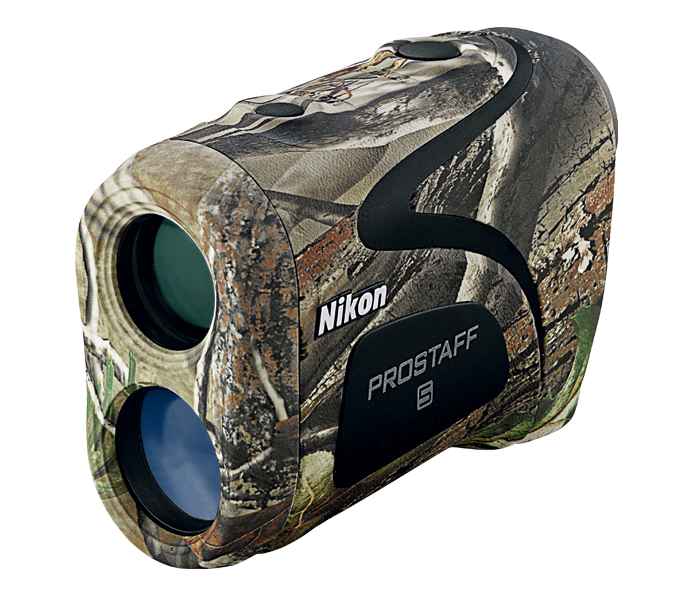 The sophisticated coating Nikon applies to the PROSTAFF 5 rangefinder’s optics goes far beyond conventional ones. Multilayer coatings, which provide an even higher light transmittance across the entire visible light spectrum, are applied to all of the lens surfaces that transmit light. This minimizes the loss of light due to reflection, thereby ensuring a more natural, clearer view. The technique has been perfected by Nikon and provides almost the same brightness through the rangefinder’s optics as that perceived by the naked eye. Nikon has manufactured the PROSTAFF 5 rangefinder, as well as many other of their optics, with a high-eyepoint design. This provides a clear field of view for everyone even with sufficient space between the users face and the rangefinder. This provides a full field of view when ranging targets even when the user is wearing eyeglasses. The PROSTAFF 5’s single button activation allows for fast, easy measurements. Automatically powers down after 8 seconds to reduce battery use. As well, flexible ranging mode capabilities allow for various hunting conditions and terrain. Fits in a pocket or a pack, and can be worn on a belt without interfering with your shot. Comfortable to carry and use all day long in any of the toughest situations your hunt can present. The PROSTAFF 5 rangefinder is built to handle virtually any environment. No matter what the weather conditions may be, you will always have a sure, non-slip grip on your rangefinder, making it one piece of equipment you can always count on to perform. The larger 18mm ocular provides a faster view when seconds count.